Your MacBook lets you reach for perfection by adjusting your track in GarageBand. You don’t think that U2 just “play and walk away,” do you? No, they spend hours after the recording session is over, tweaking their music until every note sounds just as it should. You can adjust the settings for a track, too. The tweaks that you can perform include adding effects and kicking in an equalizer. In the Track list, click the desired track to select it. Click the Track Info button. Click the Edit tab to display the settings. Each of the effects has a modifier setting. For example, you can adjust the amount of echo to add by dragging its slider. 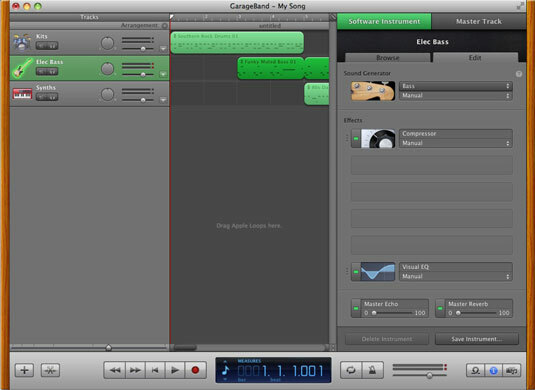 GarageBand offers a Visual Equalizer window that you can use to create a custom equalizer setting for each track. You can display the Visual EQ window by clicking the animated button next to the Visual EQ control on the Edit pane. To change the Bass, Low Mid, High Mid, or Treble setting for a track, click and drag the equalizer waveform in the desired direction. To save the instrument as a new custom instrument, click the Save Instrument button. Now you can use the instrument the next time you add a track. Click the Track Info button again to return to GarageBand.